In what has become a regular feature of their recent meetings, parents and advocates of African American students in the Elk Grove Unified District have taken trustees to task. The most recent advocacy occurred at the Tuesday, June 26 meeting of the EGUSD trustees. At this meeting five adults spoke on behalf of African American students. Among their concerns from many advocates and parents of African American students is the belief their children being targeted by on campus police officers, known as campus resource officers. One speaker at Tuesday night's meting was Allegra Casimir-Taylor. 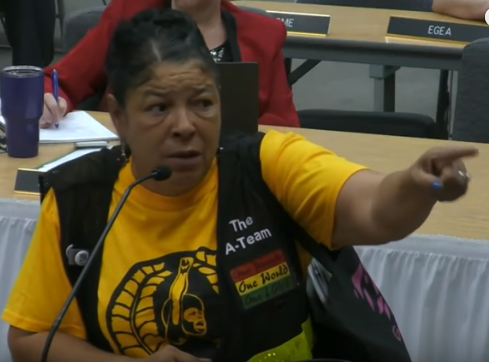 While Casimire-Taylor made pointed references to trustees Carmine Forcina at the 2:00 minute and Chet Madison Sr. at 2:27 minute marks, she also criticized the entire board. Noting the Tuesday, June 12 meeting where trustees openly argued with each other, Casimir-Taylor reprimanded their behavior. "How can we trust this board to help with the problems at hand with our black students, when you got a problem with yourselves," Casimir-Taylor said. She went on to say, "How can we trust you, when we walk out the door, you get into a fight that is blasted all over for everybody to see, and you look like idiots." Casimir-Taylor's entire testimony during public comment can be viewed below. EGUSD Board meetings are quickly turning into a circus! Betcha the home builders are getting night sweats worrying about whether prospective buyers will start digging into the performance of the EGUSD, and whether the past glory of the EGUSD which helped sell homes before, has now petered out. Betcha Region Builders is gonna start "managing" the next few Board elections!